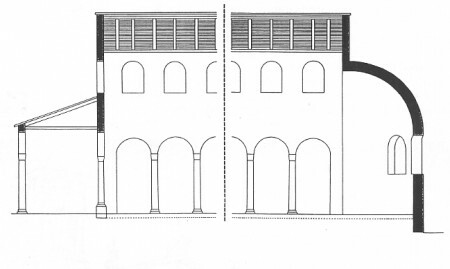 Of the huge basilica, which, including the atrium, measured about 29 meters wide (95 feet) and 80 meters long (262 feet), only a small portion of walls have been preserved above foundation level. Circa two-thirds of the complex have been preserved at foundation level only. Thus, the information gained for the furnishings of the interior of the church is scarce. It can be stated with considerable certainly, however, that the church was a colonnaded basilica mainly built from spolia or spoils from other buildings; even the mosaic floor, which has been found in certain areas of the church, consists of spolia tesserae. It was possible gain a large quantity of datable material from the trenches in different areas of the church’s foundations. An analysis of the ceramic fragments, largely dating from the late third and early fourth century, confirmed that the complex was in fact built in the time of Constantine. becomes clear from the excavation, Constantine had the whole site leveled and earlier buildings torn down before the new basilica was built. 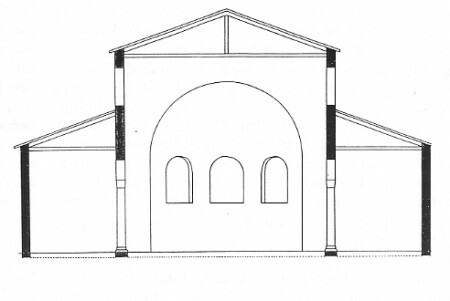 The church was not hidden by earlier buildings on the same site, as, for example, the cathedral in Portus, but dominated the south of Ostia as a distinctive structure. From the fifth/sixth century on, the church also served as a burial place: raised sarcophagi, which had been lowered into the ground, were found in the western part of the nave and the atrium. The church was in use at least until the seventh century, since its apse (which had probably been destroyed during an earthquake) was rebuilt at that time. The church was reduced in size most probably during the early medieval period. In the forecourt to the atrium, poorly built residential complexes were found. Remains of cooking places were found in the western part of the church. Had the church been reduced to a small part in the east, as can be shown for other places? The church complex was abandoned no later than the Carolingian period. A broad stratum of rubbish with a lot of ceramic fragments of this period was found and the collapsed southern exterior wall covered the already mostly destroyed floor. This information matches with the tradition recorded in the Book of Pontiffs, which states that under Gregory IV (827-844), Ostia Antica was abandoned and the city transferred to the area of the current Borgo. Franz Alto Bauer and Michael Heinzelmann are scholars with the German Archaeological Institute in Rome, Italy.